Authentic, well-seasoned and rich roast meat flavor. 9 out of 10 chefs love its delicious taste. 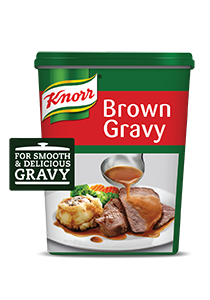 Knorr Brown Gravy is perfect over mashed potatoes, roasts, and for buffet carving stations. When you hear the name gravy, you automatically think of British cuisine. However, Knorr Brown Gravy Base is versatile enough to use with Arabic cuisine as well. Try using it for all your meat and rice dishes, like Hashwet al-Ruz.